The Sidebar Entertainment Gadget is a freeware Windows Vista/Windows 7 sidebar gadget/widget that adds the functionality of online radio, anytime and anywhere. 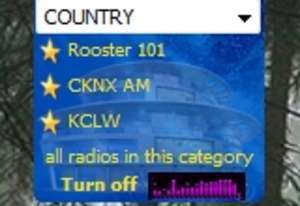 It gives access to a list of popular Internet radio stations directly from your desktop. The creators of this widget have spent a lot of time finding some of the best radio stations online and bring them right to your desktop completely free! For security reasons, you should also check out the Sidebar Entertainment Gadget download at LO4D.com which includes virus and malware tests. Additional screenshots of this application download may be available, too. Offering up some very cool and useful widgets/gadgets for Windows and beyond. Some widgets provided functionality like weather, alarm clock and novelty. Check out some of the freeware downloads available in the widget category. They contain no strings and are available at zero cost. 4.67 out of 5 based on 3 ratings. Sidebar Entertainment Gadget has a presence on social networks. TrustRank Based on many factors, we give this program a Trust rating of 4 / 10.